17 Aug 2018 --- In light of recent findings from the Joint Research Centre (JRC) which revealed that EU households generate roughly 35kg of fresh fruit and vegetable waste per person, per year, “lifestyle hacks” to prevent avoidable waste are high in demand. Notably, Korean grocery store E-Mart has presented a clever packaging concept designed to reduce the number of bananas which are wasted by consumers once purchased. 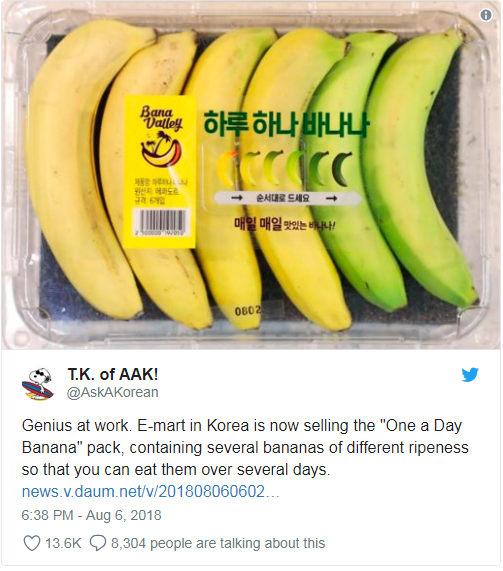 As shared by Twitter account and blogger @AskAKorean and Korean publication Daum, E-Mart has begun selling packed bundles of bananas which vary in their level of ripeness. The idea is that the consumer will have a banana of optimal ripeness ready every day – hopefully decreasing the instances that over-ripened bananas end up in the trash. The bananas in the pack appear to go from green and unripe to Click to Enlargeperfectly ripe and ready to eat. In terms of food waste, this attempt may well decrease the number of wasted bananas. However, some commentators have suggested that this design is an unnecessary use of packaging at a time when the global community is struggling to find a sustainable solution to the scourge of plastic pollution. Critics of this packaging have highlighted the fact that overripened bananas can be used in cooking curries, pancakes and other recipes, while some argue that banana skins already provide a natural packaging and plastic wrapping only allows shoppers to think less about their buying and consumption habits. The UN's Food and Agriculture Organization (FAO) estimates that about one-third of the food produced globally for human consumption is lost or wasted. The recent study by the JRC highlighted that of the 35kg per person of fruit and vegetable waste in the EU, 14kg of this could be avoided. The study found that the avoidable waste could be reduced by applying targeted prevention strategies and that the unavoidable waste (inedible parts of the product) could be much more sustainably managed at the manufacturing stage and recycled for use in the circular economy. Of course, a vital role of food packaging is to combat food waste by extending shelf-life by preserving the processing benefits of food and protecting the product from external influences and damage. In this way, the food packaging industry already plays a role in the reduction of food waste, but it is refreshing to see it engaging in the issue and supplying innovative solutions. One further example of tackling banana waste is a filter innovation from It’s Fresh! in Costa Rica. The filter absorbs the ripening hormone – ethylene – from bananas in a transit environment, doubling the “green” period to an average of 70 days. Circular economy and resource efficiency experts, WRAP, estimate that the UK alone currently consumes more than five billion bananas each year, and throws away 1.4 million each day. In this way, such a filter could preserve the life-spans of many a banana, especially as supermarkets largely only want to purchase green bananas. This commonly leads to bananas that have ripened in transit being wasted prior to reaching the end customer. You can read more about food waste in our special reports on the topic, focusing on landmark laws and the circular economy and retailers, innovation & technology.